Facebook has removed, then restored, a series of adverts that called for the social network to be broken up. 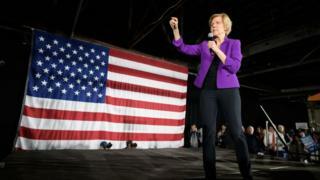 The adverts were placed by the campaign for Democratic presidential hopeful Elizabeth Warren. Ms Warren has made a public pledge to break up Facebook and other tech giants if she is elected. Facebook said it removed the adverts because they misused its corporate logo. It said it restored them to help "robust debate". Ms Warren responded to the removal of the adverts in a tweet saying Facebook's ability to "censor" what people saw was a good demonstration that it had too much power. Last week, Ms Warren said it was "time to break up our biggest tech companies" and added that the move would "restore the balance of power" in America's democracy and promote proper competition in the tech sector. Facebook, Google, Amazon and Apple would all be targeted in the break-up effort, Ms Warren's campaign office has said. There are strict rules governing who can use Facebook's corporate logo. These were brought in to stop advertisers using them to make marketing material look like official communications from the social media platform. Facebook added that it did not remove all the adverts the Warren campaign ran calling for the forced separation of Instagram, WhatsApp and Facebook. Some remained because they did not use the logos of those firms. Adverts mentioning Amazon and Google were also unaffected by the removal effort. Ms Warren represents Massachusetts in the US Senate and is seeking the Democratic nomination for the 2020 presidential election.